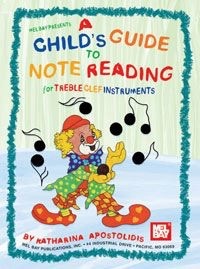 A coloring and activity book to help children learn the names of treble clef notes with fun and lively pictures. Included are small learning steps and various creative works, puzzles and games. The book begins with the notes of the C major scale. It is possible to start at any other page also with sharps and flats. Every note is connected to an animal or a symbol which starts with the same letter (i.e. “G” for giraffe). The volume is suitable for instrumental classes in single lessons as well as in groups. A well devised and at the same time very versatile method for children.